A regular cleaning involves scaling and polishing procedures that remove plaque, tartar, and stains from the exposed areas of teeth. 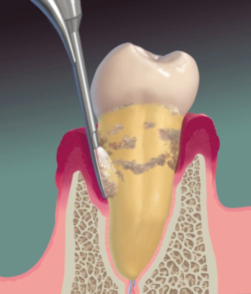 The scaling process scrapes away bacterial plaque and tartar from the tooth. In a regular cleaning, scaling is performed on the part of the tooth that is exposed above the gum line. A deep cleaning is a periodontic procedure used to treat early-stage periodontal (gum) disease . The dentist, periodontist (gum specialist), or dental hygienist removes the plaque through a deep-cleaning method that combines scaling and root planing. Scaling is performed above and below the gum line to remove plaque and tartar. Root planing gets rid of rough spots on the tooth where germs gather, and helps remove bacteria that contribute to gum disease.